The Monitor | Aerosol Monitoring & Analysis, Inc.
OSHA has published a small entity compliance guide to assist small businesses within the construction industry with the new Crystalline Silica Rule. The Rule went into effect on June 23, 2016 and the Construction Industry compliance date is June 23, 2017. Reduces the permissible exposure limit (PEL) for respirable crystalline silica to 50 micrograms per cubic meter of air (50µg/m3), averaged over an 8-hour shift. Provides flexibility to help employers – especially small businesses – protect workers from silica exposures. If you have questions about complying with the new standard, are interested in training your workforce or need exposure monitoring or lab analysis, please complete the form on the “Contact” tab on top right side of our website. Maryland Department of the Environment (MDE) is currently in the process of procuring an independent organization to administer the Asbestos 3rd Party Exams. If a qualified vendor is selected, it is possible that examinations will begin to be administered independently in July, 2017. Until then, MDE’s current schedule for Asbestos Examinations is available here. AMA has attempted to synchronize our asbestos training course dates so that training courses precede the MDE test dates by only a few days. On May 4, 2015, the Occupational Safety and Health Administration (OSHA) published a final rule and new standard for construction work in confined spaces. 29 CFR 1926.1200 Subpart AA (Confined Spaces in Construction) is now aligned with those protections found in the General Industry standard. All construction employers, whose workers may be exposed to confined space hazards, are affected by the rule. Additionally, all employers must have a written confined space program if workers will enter permit spaces. The rule goes into effect August 5, 2015. The U.S. Secretary of Labor, Thomas E. Perez, indicated in a statement that “[the rule] will prevent about 780 serious injuries every year”. More detailed provisions requiring coordinated activities when there are multiple employers at the worksite. This will ensure hazards are not introduced into a confined space by workers performing tasks outside of the space. Requiring a competent person to evaluate the work site and identify confined spaces, including permit spaces. Requiring continuous atmospheric monitoring whenever possible. Requiring continuous monitoring of engulfment hazards (e.g. when workers are performing work in a storm sewer). Allowing for the suspension of a permit, instead of cancellation, in the event of changes from the entry conditions list on the permit or an unexpected event requiring evacuation of the space. The space must be returned to the entry conditions listed on the permit before re-entry. Requiring that employers who direct workers to enter a space without using a complete permit system, prevent workers’ exposure to physical hazards through elimination of the hazard or isolation methods such as lockout/tagout. Requiring that employers who are relying on local emergency services for emergency services arrange for the responders to give the employer advanced notice if they will be unable to respond for a period of time. Requiring employers to provide training in a language and vocabulary that the worker understands. 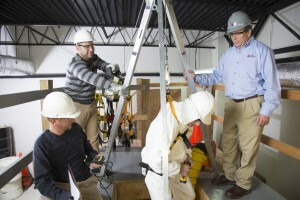 OSHA will also treat compliance with this new rule as compliance with the general industry confined spaces rule when one or more employers are engaged in both general industry work and construction work at the same time in the same space. OSHA can assess a maximum penalty of $7,000 for each serious violation/failure to comply with the new rule and $70,000 for a willful or repeated violation. 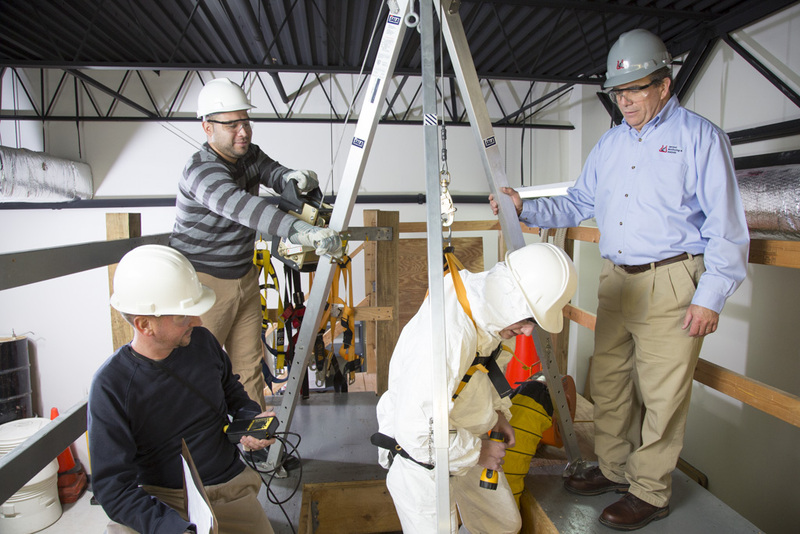 AMA’s 8-Hour OSHA Confined Space Course is compliant with Confined Spaces in Construction AND General Industry Confined Space. This entry was posted in The Monitor on June 3, 2015 . The Maryland Department of the Environment (MDE) has released the Asbestos 3rd Party licensing exam schedule dates for July – December 2015. 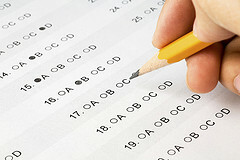 To view the 3rd party exam schedule click here . MDE is now utilizing a new photo ID card system. Participants no longer need to provide a passport-sized photo for the license (MDE takes photographs on-site). 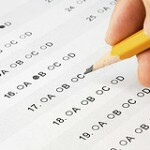 Additionally, after completing an examination, participants can wait to receive their score and license. This entry was posted in The Monitor on May 26, 2015 . The requirement that all employers must report all work-related in-patient hospitalizations, amputations and loss of an eye within 24 hours to OSHA. You can report to OSHA by calling 1-800-321-6742, calling the local area office, or use an online form. Establishments located in States under Federal OSHA jurisdiction must begin to comply on January 1st, 2015. Maryland Occupational Safety and Health (MOSH) is instructing employers to comply with OSHA’s revised rules. Virginia Occupational Safety and Health (VOSH) has indicated that a statute needs to be passed before the record keeping rules become law in Virginia. This entry was posted in The Monitor on February 18, 2015 . Do you need assistance with AHERA compliance? AMA can help. We routinely perform AHERA inspections, re-inspections and develop management plans. This entry was posted in The Monitor on February 3, 2015 . Paint-related work on the exterior of homes is not practical during the colder months and therefore, Maryland offers an exterior winter waiver option for affected pre-1978 rental properties. The Maryland Department of the Environment (MDE) defines the exterior winter waiver as an inspection option used to temporarily delay a property owner’s obligation to perform exterior paint stabilization necessary to meet the Lead Paint Risk Reduction Standards. The exterior winter waiver option period typically lasts between November 1st and April 1st. Owners can obtain an exterior winter waiver by contacting the local code official in the county or municipality where the property is located (MDE is not authorized to issue exterior winter waivers). If no local code official exists, the property owner must contact the Department of Housing and Community Development. Baltimore City has implemented an automatic waiver period beginning November 1st and ending April 1st. After obtaining the exterior winter waiver, an inspector can skip the visual inspection portion of the exterior for full risk reduction compliance. The inspector must ensure that the inspection certificate they issue has the exterior waiver option checked. Please note: The exterior winter waiver must be obtained prior to completing an inspection. At the conclusion of the waiver period, all defective paint must be repaired/stabilized and/or removed by an accredited lead paint contractor (under the supervision of an accredited lead paint supervisor). The property must pass the re-inspection within 30 days after the end of the waiver period (usually April 30th). The exterior winter waiver cannot be used when issuing a limited lead free certificate. To qualify for a limited lead free certificate, the exterior of the property must not have any chipping, peeling or flaking paint regardless of when the inspection occurs. This entry was posted in The Monitor on January 21, 2015 . On September 9th, 2014, Congress passed D.C. Act 20-365 (Air Quality Amendment Act of 2014), part of which amended the Rental Housing Act of 1985. This “mold” amendment directly impacts property owners/managers, mold inspectors, and mold remediators. Require a residential property owner to remediate indoor mold. DC will require certifications/licenses for individuals that perform mold assessments or mold remediation. A threshold level of indoor mold contamination will be established that requires remediation at residential properties. Indoor mold assessment methods and standards will be established. Performance standards and work practices for conducting mold remediation will be established. Submission of a mold remediation report to DDOE and the residential tenant upon completion of remediation activities may be required. AMA will continue to provide updates on the D.C. Mold Regulations. This entry was posted in The Monitor on November 12, 2014 . On January 1, 2015, all Maryland residential rental dwelling units built prior to 1978 must be in compliance with Title 6, Subtitle 8 of the Environmental Article, Annotated Code of Maryland (Maryland’s “Lead Law”). Currently, compliance is required for residential rental dwelling units built prior to 1950. Affected properties that “opted out” of the previous requirement can no longer do so. According to the EPA, 24% of homes built between 1960 and 1978 are likely to contain lead-based paint. Utilize MDE trained and accredited workers, supervisors and contractors to perform work. Properties that have been tested and issued a Lead Free or Limited Lead Free certificate.